They made thieves of us. Time to steal what's ours. Paige Mahoney has escaped the brutal prison camp of Sheol I, but her problems have only just begun: many of the survivors are missing and she is the most wanted person in London. As Scion turns its all-seeing eye on Paige, the mime-lords and mime-queens of the city’s gangs are invited to a rare meeting of the Unnatural Assembly. Jaxon Hall and his Seven Seals prepare to take centre stage, but there are bitter fault lines running through the clairvoyant community. Then the Rephaim begin crawling out from the shadows. But where is Warden? Paige must keep moving, from Seven Dials to Grub Street to the secret catacombs of Camden, until the fate of the underworld can be decided. 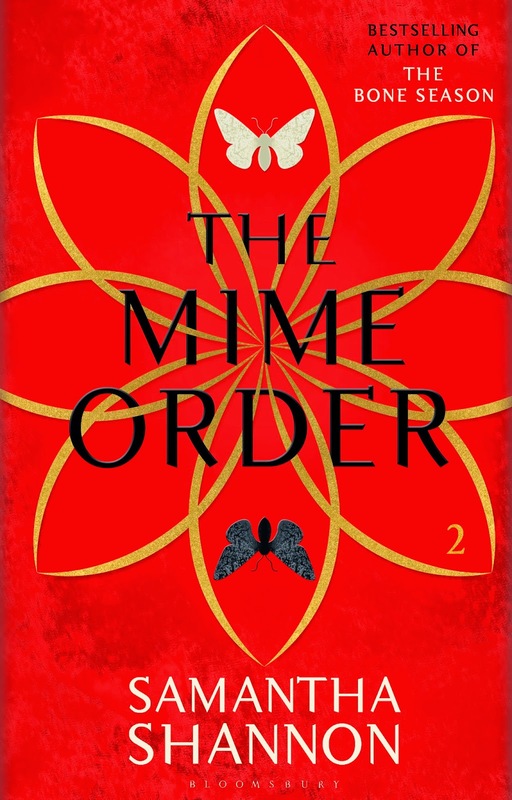 The Mime Order is the second book in the Bone Season series. Please consider buying The Mime Order from your local independent bookshop. Alternatively, you can click one of the links here to purchase from a retailer online. For translations, take a look at the list at the bottom of this page. Miss Shannon thank you:) Thank you for creating this amazing world. I have read TBS twice now. I find myself washing dishes or making the bed and thinking to myself "I wonder what Paige is doing? or Where is Warden, is he ok?" I can't wait to actually find out! 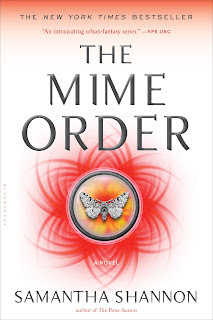 Loved reading the book description for The Mime Order. Keep throwing us scraps please! It will help pass the time until TMO is released:) Much love from OHIO!! I'm so glad to hear you enjoyed it! I will throw as many scraps as possible. You are such an amazing writer and such a wonderful inspiration! I've literally just finished TBS and I have nothing more to say than it was an absolutely perfect read. Your characterization has depth and color and your story is beyond compare. The wait until October seems impossible! Truly fantastic writing, thank you for sharing with us. Much admiration from the U.S.! I know The Mime Order is going to be another brilliant book. Good luck with it Samantha. I am soo excited for the second book. Please tell me it will be available for Kindle as well??? I read everything that way and hoped to pre-order it. LOVED the Bone Season. And I'm an adult with a child! It should be available on Kindle, yes – check Amazon. Great to hear you liked the first book! I am so EXCITED for The Mime Order!! I absolutely adore The Bone Season, and I fell in love with you, your blog, and most importantly: your books! I even recommended The Bone Season to my high school literature teacher and gave her my copy, and she likes it so far, but she hasn't finished. I want to pre-order The Mime Order so bad (I am in the U.S.), but I want to hold out for now because sometimes the stores do a thing like "pre-order now and get a free poster!" or something like that, so do you know if any of the providers plan to do that? The Bone Season left me wanting so much more, and I was ecstatic when I saw you plan to make it seven books. Can't wait for The Mime Order in October! So far away!!! Glad you like the book, and thanks for recommending it! I am thrilled to see " The Mime Order" have a release date. I devoured "Bone Season" and want to say thank you to Ms. Shannon for such wonderful work. Ps- the audio book version of "Bone Season" is truly well done and delightful. Thank you! I love the audiobook, too. The narrator did a great job. When you get around to considering doing another audio book can you please get Alana Kerr to narrate it. She is bloody marvellous!! and makes Paige come to life :) As a library Technician I long for a captivating audiobook to see me through my shift, and thus far your Bone Season is my favourite! I hope Alana will be able to narrate the next one. She did a wonderful job with 'The Bone Season'. I just finished reading bone season and i loved it. it is intelligent and it should be fun to See Paige growing up with her gift in the next Part. she wants to be Seen. that is what we All want.... of course. i loved the jumps into Paiges past. I'm twelve years old and aspire to be a novelist one day. The Bone Season was such an inspiring book. Thank you for bringing the world of Scion to us! I can't wait for the second book! You're welcome! Good luck with your writing. I have just recently discovered your book on the recommendation of a friend, and after reading the first chapter of The Bone Season, I was hooked! I absolutely love your writing style and I was so sad when I reached the end of your book. When I heard that there will be a sequel, I could not have been anymore excited. I did some research, and found a link on the Bone Season website that led to a preview of the first 4 chapters of The Mime Order, but it didn't work! I'm super bummed out and was wondering if there is any other way to read that sneak peek...as January 2015 is so far away until the actual sequel comes out! Your book is fantastic, and I wish you continued success in the future! I'm so glad you enjoyed the first book! Unfortunately the 4-chapter sampler was only up for a week. I'm not sure if Bloomsbury plans to put it up again, but if you keep an eye on the book's Facebook page (www.facebook.com/TheBoneSeason), they might put up some previews and other tidbits nearer the time. Sorry, it's my publisher's decision when the book comes out! I'm so glad you enjoyed the first book. The bone season was so good and I read it within a week. Can't wait for the mime order. Would be good if you did book signings in Scotland, especially in edinburgh ;)!!! I may actually be coming to Edinburgh in 2015! I loved reading The Bone Season! I read it in three days! I was just wondering if the release date January 27, 2015 only applies to the hardback. Ot does it also include the release of the paperback edition? It's just the hardback. Paperback will be out later. I just finished The Bone Season. I picked it up this morning and nearly read it straight through (I did take a break to walk the dogs). It was one of those decadent, indulgent reading experiences, like the mental equivalent of eating an entire bar of chocolate at once. Thank you for sharing your gifts with us. I look forward to The Mime Order, and to all that follows. I am so excited for the release!! I finished the e-galley about a week ago and adored it. You're so talented Samantha! Hello Samantha I really love the Bone Seanon it's my favourite book and I wanna read The Mime Order, but it's not in Spanish. Do you know when it is going to be published? I think that you're one of the most sensationals writers of the world and I enjoy how you express in the book and they history is very exciting. I'm very fan of you, if you come any time to Murcia (Spain) I will going to see you in person, you're my favourite writer on the world. My name is Jess and I live in Brisbane, Australia. I just wanted to let you know that your writing style has inspired me to continue with my passion of fictional literature; both reading and writing it. I am utterly overwhelmed with excitement at the prospect of reading your latest book. Thank you for producing such an appealing storyline in the Bone Season and I wish you the very best in the future. Thank you, Jess! I'm so glad to hear that. Thank you for reading the book. Hi Samantha, the world you have created is simply amazing. I am counting the days until the Mime Order is released in the UK. I've read TBS three times already as it is so good! Your talent for transporting readers to another world is amazing and I hope you continue to write in this manner! 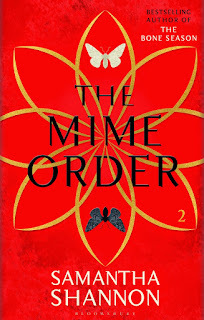 I am a huge fan of TBS and my copy of the Mime Order has arrived today - I can't wait to read it!!! Thank you for writing these book! Just finished The Mime Order and my heart is still racing! It's such a good feeling when you finish a book and immediately want to read it over again. Thank you :) Best of luck as you continue with this amazing series. I cannot wait see where the next book takes us! AAAAAAAAAAAAAAAAAAAAAAAAAAH! My copy of TMO arrived last week and it is so damn good, like, holy zeitgeist, how do you write so good! WHERE IS WARDDEN?? I've been driving everyone I know mad going "I wonder what Warden is doing! I wonder when he's coming back! I wonder if he's gotten anywhere on Nashira yet!" IT IS SO GOOD HOLY ZEITGEIST I CAN'T PUT IT DOWN!!! Hi, who exactly is "that poltergeist" and "an old enemy", the poltergeist that the Abbess used on the Syndicate when she was taken away? Is it Gomeisa? Hello from Mississippi, United States! I absolutely adored The Bone Season. This book has everything that I have been looking for. The adventure you took us on with Paige was extraordinary, and the world was so real, it was hard dragging myself out to do normal daily things like going to class and work (and sleep! lol). I am about to dive into The Mime Order, but I'm sad because I know it will be over all too soon. I haven't even read the second book yet and i am already anticipating the third! Thank you for the wonderful writing, can't wait to see what other adventures you bring us on! Hi, I can't see Polish on the translations' list. Do you have any plans for it? For my own pleasure I am writing a story based on your world of Scion -an amateur fanfiction- and I was wondering if you could explain in more depth how unsighted voyants like Paige sense whether people are voyant or amaurotic? Thank you for your kind comments. I'm really glad you enjoyed the book, and I hope you like The Mime Order. Hi Samantha! I'm an italian reader and I've almost finished The Mime Order. I love it and I'm trying to read it as slowly as I can because I can't resist until the next one! I'd like to know, for me and the other italian readers, when I could find it translated in italian! Hi there! I'm afraid my Italian publisher, Salani Editore, hasn't bought rights to The Mime Order. They're more likely to buy them if they know there's demand, so perhaps you could contact them to tell them you'd like to read it. Hello Samantha .I love The Bone Season so much. Thank you Thank you Thank you! Do you know when The Mime Order will be translated to Hebrew? I tryed to ask Agam Books but they didnt respond. Me and my friend Catherine are in love with this book. You're godness. We love you ;) I have read it many times, but I never got bored. It's so good. 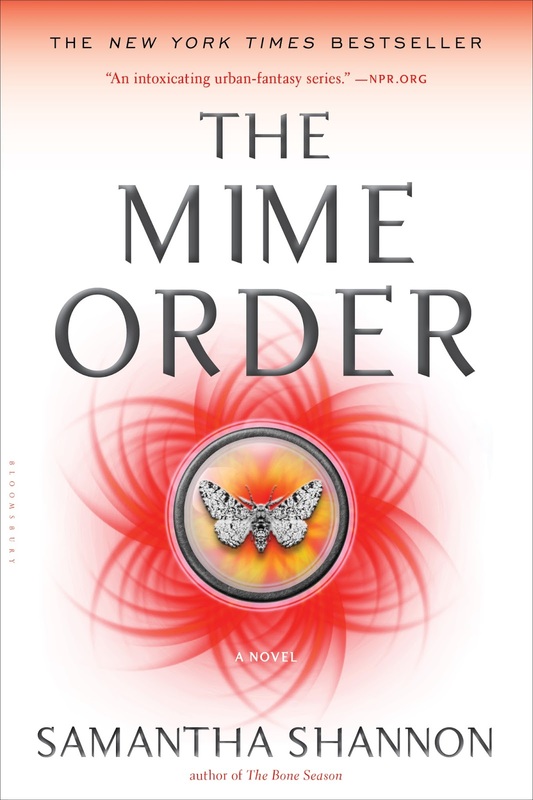 We're looking forward to read The Mime Order. I'm so glad to hear that, Christina! Hope you enjoy The Mime Order. I absolutley loved The Bone Season. I really think you are an excelent author. I just have one question, I hope it's not too much. 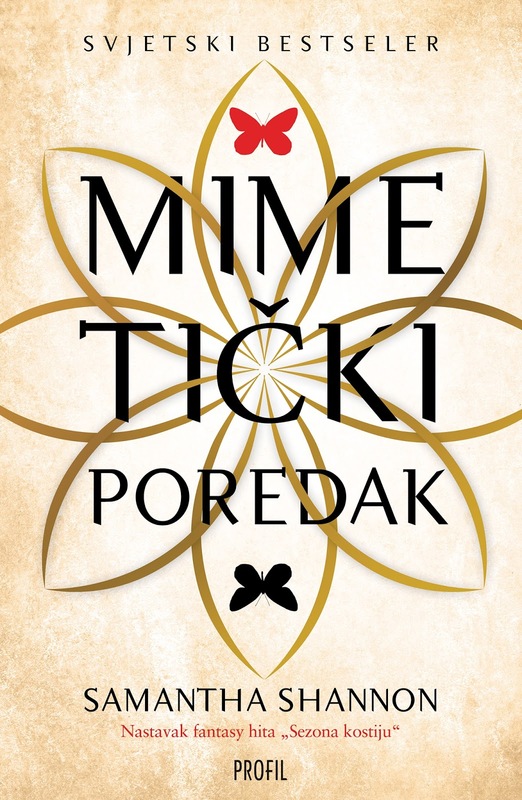 I would like to know, will The Mime Order be published in Slovene language? Thank you and greetings from Slovenia. Hello! Thanks for your kind words. 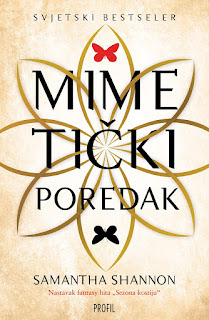 My Slovene publisher hasn't bought The Mime Order yet. Hi Samantha, I totally agree with the others! Your second book didn't let me sleep, but I don't care...;-) the Mime Order left me speechless and I absolutely adore your writing style. It is very fascinating how we can get into the caracters although we just know what Paige thinks. All the caracters are great, even the bad ones. The fight between Jax and Paige was just amazing! Also the scene where she surprised him and the other clairvoyants - just brilliant! Thank you so much! I'll never stop, I promise. Samantha,I love your book series. 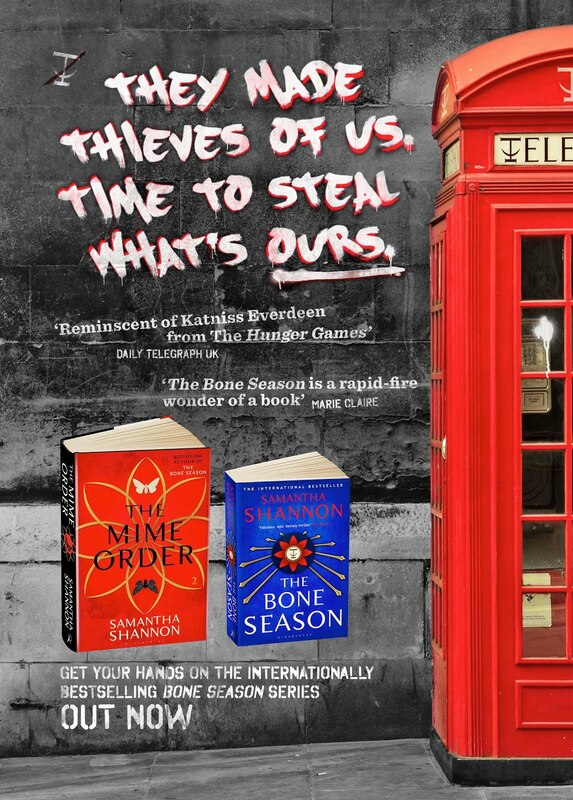 I read both 'The Bone Season' and 'The Mime Order'. Is there a continuation to it? Please tell me there is! Without me knowing what comes next, I'm not I'll be able to sleep at all. All day I'm thinking what will com next. Will Jaxon Hall fight Paige in spirit form or will Paige flee to tell Warden about it. Please, please tell me you are writing a third book to it. Love your writing style. Love the amazing world you created for us, your audience. I'm so happy to hear you liked the first two books. And yes, the story does continue! There will be seven books in the whole series. The third installment is called ‘The Song Rising’, and it's out in November 2016. Samantha, I am spanish, sorry for my english if I make a mistake. I read one year ago 'The Bone Season' and since then I waited for the second, Do you know when will be published in Spanish ? I hope it's soon ! Please, try to be publish as soon as possible in Spain, you have many readers here, I can not stand to read it! Hello, Samantha, I am Spanish and I feel if I make a mistake when typing. A year ago I read 'The Bone Season' and since then I have been waiting for the second book. Do you know when it will be published in Spain?, I hope soon, you have many readers here. I love your way of writing and all the characters you've created (Jaxon, Paige, Nick...) and I would like to know what happens to them. I can't wait! Yes!! In Spain we're aiming to have your second book translated soon. However, I couldn't wait to it and when I went to London I bought TMO for my own.